Under the nondelegation doctrine, federal agencies are authorized by "enabling legislation" to promulgate regulations (rulemaking). The process of rulemaking is governed by the Administrative Procedure Act (APA): generally, the APA requires a process that includes publication of the proposed rules in a notice of proposed rulemaking (NPRM), a period for comments and participation in the decisionmaking, and adoption and publication of the final rule, via the Federal Register. On March 11, 2014, Rep. Darrell Issa introduced the Federal Register Modernization Act (H.R. 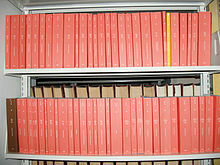 4195; 113th Congress), a bill that would revise requirements for the filing of documents with the Office of the Federal Register for inclusion in the Federal Register and for the publication of the Code of Federal Regulations to reflect the changed publication requirement in which they would be available online but would not be required to be printed. The American Association of Law Libraries (AALL) strongly opposed the bill, arguing that the bill undermines citizens' right to be informed by making it more difficult for citizens to find their government's regulations. According to AALL, a survey they conducted "revealed that members of the public, librarians, researchers, students, attorneys, and small business owners continue to rely on the print" version of the Federal Register. AALL also argued that the lack of print versions of the Federal Register and CFR would mean the 15 percent of Americans who don't use the internet would lose their access to that material. The House voted on July 14, 2014 to pass the bill 386–0. ^ "Browse Code of Federal Regulations (Annual Edition)". FDsys. US Government Publishing Office Federal Digital System. Retrieved 2014-05-23. ^ a b c "Federal Administrative Law". Duke University School of Law. Retrieved March 10, 2014. ^ "eCFR – Code of Federal Regulations". FDsys – US Government Publishing Office Federal Digital System. 2014-05-21. Retrieved 2014-05-23. ^ "Electronic Code of Federal Regulations". Office of the Federal Register. Retrieved March 10, 2014. ^ "About Code of Federal Regulations". Government Publishing Office. Retrieved March 10, 2014. ^ "H.R. 4195 – Summary". United States Congress. Retrieved 14 July 2014. ^ "H.R. 4195 – All Actions". United States Congress. Retrieved 14 July 2014. "About Code of Federal Regulations". Government Publishing Office. "Report to Congress on the Costs and Benefits of Federal Regulations". Office of Management and Budget. September 30, 1997. "The Federal Register Tutorial / The Federal Register: What It Is and How to Use It". Office of the Federal Register.